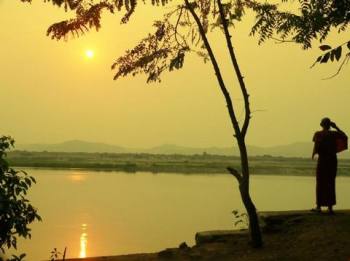 Discover Myanmar&apos;s most important artery: along the Irrawaddy you will be able to experience the typical features of Burmese culture and daily life. Come on an Irrawaddy River Cruise and get to know a world steeped in Buddhism with a colourful history. The 2170 km-long Irrawaddy flows through the country of Myanmar. Rising in Tibet, it flows through Myanmar from north to south before discharging into the Indian Ocean through a colossal 40,000 km² river delta. The best time for an Irrawady River Cruise is between November and April. The Irrawady is navigable for some 1400 km of its length downstream of Bhamo. The city lies in the north of Myanmar and has a long tradition as a trading city. Mandalay lies in the heart of the country and is the second-largest city. It is regarded as the actual centre of Burmese culture and has also become renowned in the West as a place of music and literature. The cityscape is defined by pagodas and Buddhist monasteries. Go on an Irrawaddy River Cruise and get to know the nature and landscape of Myanmar, so decisively shaped by the Indian monsoon, with its fertile soil and extensive forests. Buddhist temples and monasteries, typical statues and images, are all inseparable from the traditional life of the people. Succumb to the fascination of this culture.